So last week i celebrated a bit of xmas after the postman surprised me with this box, decorated with a cloud and birds... i mmediately knew where that box came from! Oh how i will enjoy the chocolate, the beautiful music, another cute little doll and this amazing selfmade bag!!! It's so wellmade i'm afraid to use it... and totally my style! Think polkadots & russian dolls!! Yay! 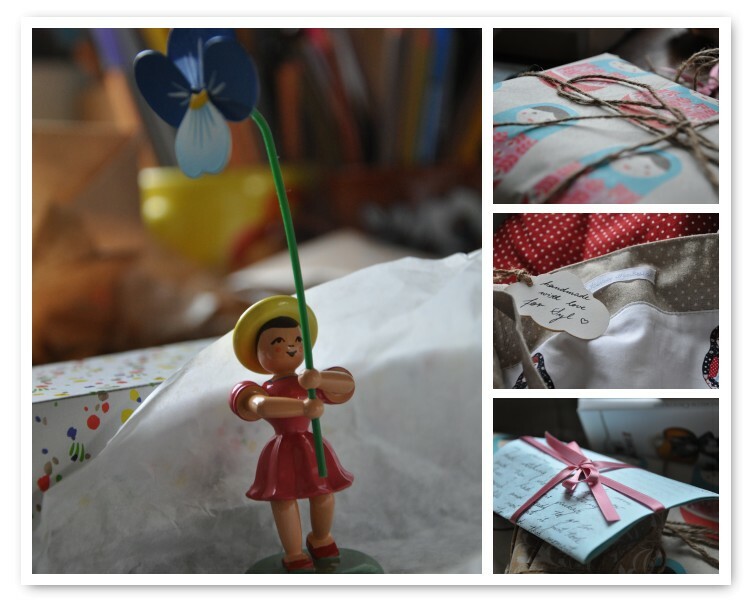 Parcels like these brighten up my day & now it's my turn cause Mina's still waiting for her xmas-gifts... Oh my! And what an exciting day this is.... we're september the 13th!! Today is THE day my friend Cy is supposed to give birth to Boelie Woelie!! I've been running around like a crazy one since yesterday cause i'm really nervous now in her place!